Monday night the Pittsburgh Penguins and Buffalo Sabres put on quite a show for the national TV audience which could have very well been an Eastern Conference Finals preview (depending upon seedings of course). The back and forth affair resulted in the Penguins overcoming a two goal second period deficit to defeat the Sabres 5-4. The game itself does not represent the bigger picture—i.e. why the Sabres and Penguins could be the best two (most complete) teams in the Eastern Conference. For the Penguins it’s obvious why they are in such a good position. Pittsburgh has star power in Crosby and Malkin, a stellar up and coming star in Jordan Staal, savy veterans like Bill Guerin and Sergei Gonchar, an incredible netminder in Marc-Andre Fleury, and oh yeah they’ve been to the finals each of the last two years (did I mention they won the Stanley Cup last year?). The future for the Penguins seems to be going very much the same way as their recent past. The one major hurdle the Penguins have had to overcome is the injury bug and even that has worked out quite well for them. Despite losing a lot of players for long stretches they have been able to get a lot of production out of the guys they’ve had to call up from their AHL affiliate which is what has kept them afloat. The experience these guys are getting is invaluable and it only bodes well for the Penguins not only for the rest of the regular season but also in the playoffs should they need someone to step up in a tight spot. SO despite some rough patches the Penguins have gone through this year you still have to consider them one of the favorites two in the Eastern Conference again this year. The Sabres do not have the big flashy stars like Pittsburgh but if you’re going to be a team that has arguably only one big star you want that start to be in net and that’s what they have in Ryan Miller. 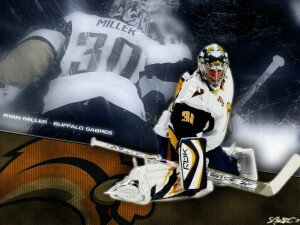 There is no doubt that Miller is one of the best netminders in not only the NHL but in the entire world. Miller’s career numbers speak for themselves but let us focus on this season alone. Miller has appeared in 47 games posting a 2.10 GAA (tops amongst goaltenders with at least 20 appearances), a .932 save percentage (best in the league) and five shutouts (second in the conference behind Marty Brodeur). Having a goaltender with numbers like that is an incredible launching point for any team, and although they do not have the star power in front of him one might like they have a bunch of players who as a group are incredibly consistent. Tim Connolly leads the team in points but he cannot carry the entire load himself and that’s when a plethora of other players pick up the slack. It seems like every night another person is stepping up to make a difference including but not limited to Derek Roy, Thomas Vanek, and Jason Pominville; in fact some nights guys like Drew Stafford or Tim Kennedy will step up big when they need to. By not having a big time star on their team the Buffalo Sabres need a number of guys to step up in the clutch and that’s exactly what they have been able to do thus far this year. This will keep teams off balance because they cannot simply shut down one guy and know the game is theirs for the taking. This is especially important come playoff time and that’s why I think the Buffalo Sabres are in prime position (as long as they stay healthy) to make a serious run at the Conference Title. 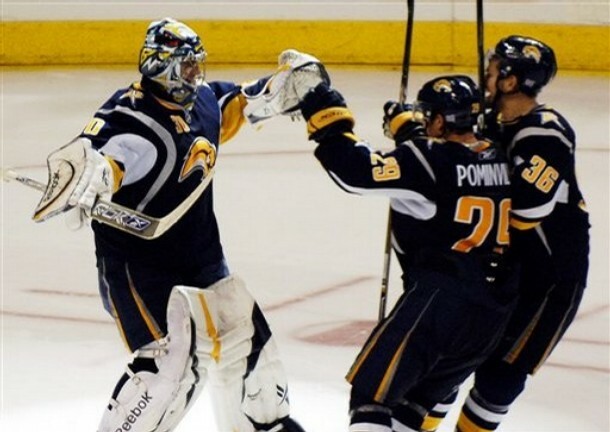 It was a good news-bad news weekend for the Buffalo Sabres as the stretch-run approaches. The Good news is that Buffalo got three out of a possible four points including a win over seemingly playoff bound Montreal. 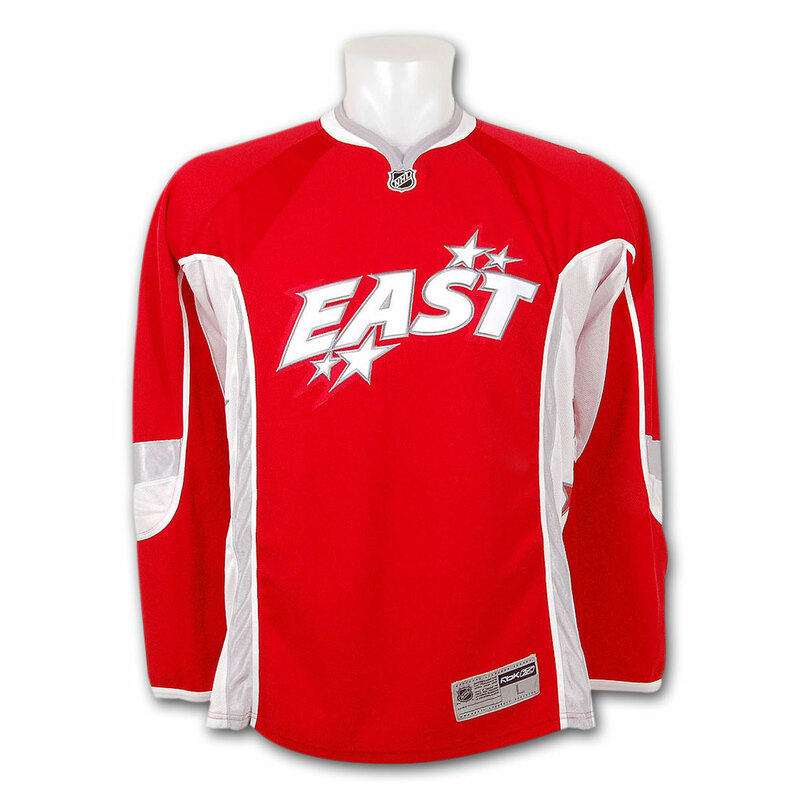 The bad news is that they lost Thomas Vanek who is the team leader in goals, overall points, and in the locker room. Vanek will be out for a month after a slapshot hit him in the face fracturing his jaw. What this means for Buffalo is that the likes of Roy and Pominville will have to pick up the slack in Vanek’s absence. It also means the Sabres will need Tim Connolly to make his presence felt even sooner than was once thought as he returns from an injury that kept him sidelined for most of the season. Perhaps most important in all this is the already heavy load on Ryan Miller will get even heavier and it may be too much to ask of a goalie who has posted amazing numbers for a team that is only in seventh position. 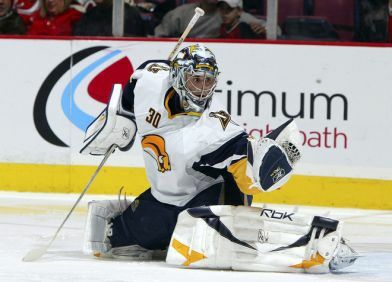 The Sabres certainly cannot replace Vanek’s 52 points—32 of which are in the form of goals—but what they can do is try to take some of the pressure off of Miller and have a little more faith in Patrick Lalime. Granted, Lalime’s numbers aren’t good and neither is his record but if the team can tighten up and take pressure off of Lalime when he plays–giving Miller even one extra day of rest–it can make a world a difference. Bottom line, if Lalime cannot relieve Miller he may wear down and it can cause the Sabres to miss the playoffs; or even if they make it Miller won’t be able to get them out of round one. However, if Miller is kept rested and the Sabres make the playoffs it greatly increases their chances of success and in that way Vanek’s injury could be a blessing in disguise but they have to play their cards right. The Montreal Canadiens’ woes continued Friday night losing 3-2 to the all-of-a-sudden surging Buffalo Sabres. Although they only gave up three goals they need much more from Carey Price now that Robert Lang is out for the remainder of the season. Price should not have to carry so much of the burden but if nobody steps up to fill the scoring void created by Lang’s absence Price will have to do it and based on his performance as of late he does not appear to be up to the Challenge. In reality the pressure should be more on Alexi Kovalev who is having a solid season with 36 points but has got to contribute more than 13 goals after posting 35 last year. Granted, there are other players who need to step their game up as well but they look to Kovalev as their leader and if he does not do the job then the rest of the team will suffer. They are still 4th in the conference but with a record of 2-6 in their last eight and a six game road trip starting next week Montreal is in serious trouble of a disastrous free-fall. The flip side of Friday’s match-up, the Buffalo Sabres , are getting healthy and getting poised to roar into the playoffs. Thomas Vanek continues his tear through the 2008-09 season with 52 points including 32 goals. Roy, Pominville, Stafford, and Kotalik (among others) are also posting great numbers which combined with the spark Tim Connoly has provided makes for a very scary team should they make the playoffs. Despite the scoring the Sabres MVP is easily Ryan Miller who is having another spectacular season. In the end however it the Sabres are asking too much of Miller and I think he’ll wear down keeping them out of the playoffs.